It is difficult to imagine the modern world without the contributions of Thomas Edison. Although Edison’s inventions are well known and his place in history firmly established, familiarity with his work doesn’t lessen the awe inspired by it. While many can lay claim to creative genius, few demonstrate the remarkable breadth of Edison’s interests. Fewer still demonstrate Edison’s business insight. His inventions, coupled with a business vision focused on commercial development, gave rise to three major industries: recording, motion pictures, and electric utilities. Edison was born on 11 February 1847 in Milan, Ohio, the last of seven children. Like many children during that era, Edison had little formal education. During his early youth his mother taught him at home. As he grew older he became more self-directed in his reading and sought out scientific books and technical journals. Born to modest means, Edison began his working life early. At age thirteen he took a job as a newsboy on the local railroad. At the age of sixteen, acting on his interest in telegraphy, he found full-time work as a telegraph operator. In 1868 Edison settled in Boston and began his transformation from itinerant telegrapher to world-class inventor. In that year Edison received his first patent—an electric vote recorder intended for use by elected bodies to speed the voting process. Although Edison’s instincts were noble, the machine was a commercial failure. For the rest of his career Edison focused on inventions that had strong commercial appeal, and therefore the potential of financial reward. In 1869, Edison moved to New York City, and it was there that he made an improved stock ticker. With the money generated by the stock ticker’s success, Edison set up his first laboratory and manufacturing facility at Ward Street, Newark, New Jersey. After several years, Edison left Newark for the small village of Menlo Park, New Jersey. At Menlo Park, Edison created the first industrial research laboratory, which contained equipment and materials necessary to work on any idea that might pique his interest. Akin to an inventor’s playground, the lab at Menlo Park became the prototype for later, modern research and development (R & D) facilities such as the famous Bell Laboratories. The Menlo Park Laboratory was followed in 1887 by a laboratory in West Orange, New Jersey. This complex consisted of five buildings which housed, among other things, a power plant, machine shops, a physics lab, a chemistry lab, and a metallurgy lab. Over the years, factories to manufacture Edison inventions were built around the laboratory. At its peak during World War I, the complex covered more than twenty acres and employed 10,000 people. With everything he needed on hand in his laboratories, Edison launched a flurry of creative and business activity that earned him the nickname “The Wizard of Menlo Park.” His first great invention (and, he once said, his favorite) was the phonograph, the first device that could record and reproduce sound. His invention found a receptive public and Edison became internationally famous. His companies manufactured both the phonograph as well as the wax cylinders and, later, the disks, that the phonograph played. In one of the rare cases of Edison shortsightedness, he refused to acknowledge the growing popularity of disc records in the early 1900s. While other companies, such as Columbia, made both discs and cylinders and let consumers make the choice, Edison stuck with the cylinder far too long. Eventually, his declining market share forced him to introduce a disc record in 1912. The second of the Edison-created industries was that of electric power generation and distribution. Edison developed practical electrical lighting and, in essence, ushered in the electrical age. Edison’s monumental achievement was not the invention of the incandescent light bulb, for which he is often mistakenly credited, but rather the invention of a complete system of electric light and power and the launching of the modern electric utility industry. Pearl Street Station, which opened in lower Manhattan in September 1882 featured safe and reliable central power generation, efficient distribution, and a successful end use (i.e., the long-lasting incandescent light bulb and electric motors developed by Edison), all at a competitive price. The one-square mile lit up by the Pearl Street station demonstrated the potential of electric power. In the 1890s, Edison began working on motion picture technology, and in the process created a third industry. Edison began commercial production of short movies in 1893, often filming in the famous “Black Maria,” the first motion picture studio. Like the electric light and phonograph before it, Edison developed a complete system that encompassed everything needed to both film and show motion pictures. Although Edison’s work in motion pictures was pioneering, the industry quickly became so competitive that Edison left the business. Edison’s inventions bought him great fame and wealth. A savvy publicist, Edison carefully cultivated a public image of eccentric genius combined with common man. By the dawn of the twentieth century Edison had become an icon of American ingenuity. During the last years of his life, Edison’s health deteriorated and on 18 October 1931, he died at the age of 84. The following minute, adopted by the Institute's board of directors shortly after Mr. Edison's death, indicates briefly the tremendous scope of his activity: "The physical life of Thomas Alva Edison, world benefactor, ended on Sunday, October 18, 1931. The spiritual benefits of his contributions to humanity continue to live. His genius, vision, patience, persistence, industry, and widely diversified talents, which brought to fruition many of his conceptions, have contributed greatly to the comfort, convenience, and happiness of mankind, and his achievements constitute a great incentive and inspiration to those who follow. In particular, his invention of the incandescent electric lamp and his conception, more than 50 years ago, of the combination of a central generating station with a suitable distributing system for electrical energy, firmly establish him as the founder of the electric lighting industry of the world. He was the outstanding world leader in the group of inventors, scientists, and engineers whose achievements in technology have produced great social and economic benefits, including the employment, in useful occupations throughout the civilized world, of tens of thousands of men and women. He was respected and admired by his associates who cherish their memory of his ability, simplicity, and other personal characteristics. Mr. Edison was, in 1884, one of the signers of the call for the organization meeting of the American Institute of Electrical Engineers, and he was elected a vice-president at the first election of officers; later he was elected an Honorary Member. His achievements caused a group of his associates and friends to establish the Edison Medal, which is now awarded annually by this Institute." John W. Howell and John W. Lieb. Photo credit: Richard Warren Lipack / Wikimedia Commons. The evolution of Edison's incandescent electric light bulb and socket - 1880-1881. Left to right: First form "1880 Wire Terminal Base" socket and bulb as used on the S.S. Columbia - first commercial installation of Edison electric lighting system; Second form "1880 Wire Terminal Base" socket and bulb; "1880 Original Screw Base" socket and bulb and the "1881 Improved Screw Base" socket and light bulb. Photo credit: Richard Warren Lipack / Wikimedia Commons. Detail of original Edison chandelier with first form "1880 Wire Terminal Base" sockets and incandescent lamps behind "Edison Pioneer" and 'Edisonian' author Francis Jehl. Photo credit: Richard Warren Lipack / Wikimedia Commons. Table card obverse reads: "Banquet by the American Electricians in honor of the Foreign Official Delegates to the International Electrical Congress" held at The Grand Pacific Hotel, Chicago, Illinois on 24 August 1893. Signatories include General Electric co-founders Elihu Thomson and Thomas A. Edison. Event occurred as Tesla Polyphase A.C. electrical system was introduced at 1893 Chicago Columbian Expo as effort to aid D.C. direct current faction cause in face of new Tesla Polyphase A.C. system soon to supplant it. Photo credit: Richard Warren Lipack / Wikimedia Commons. Table card verso bearing printed inscription reading: "The Grand Pacific Hotel - Chicago, Thursday, August 24th, 1893," for banquet held in Chicago, Illinois by the American Electricians in honor of the Foreign Official Delegates to the International Electrical Congress. Signatories include H.Helmholtz, A. Palaz and T. A. Edison. 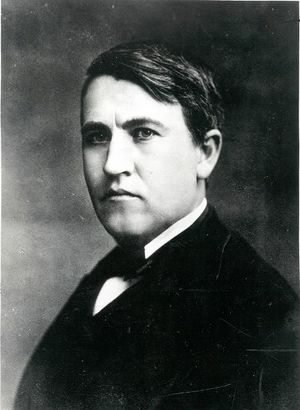 Provenance is estate of Thomas A. Edison. Photo credit: Richard Warren Lipack / Wikimedia Commons. Westinghouse Corporation Tesla based Polyphase A.C. electric light display shown in foreground dominating Edison-Thomson General Electric Company D.C. / direct current based electric lighting display at the 1893 Chicago World’s Fair.